One of my favourite things to do is to make handmade presents for my loved ones. Many of my close friends have (beautiful) children now and it’s lovely to be a part of their lives and be invited to help celebrate their special occasions. Just recently I made some pretty pink bunting for little Amelia for her first birthday and today it was her Christening. I wanted to make her something that would mark this special occasion but also be something which she’ll (I hope) appreciate too when she is grown up. So out came the sewing machine a few weeks back. It was such a pretty design I couldn’t help but make a few extra versions of it, which I have, of course, named the ‘Amelia’. It’s a 40cm envelope backed cushion (with the usual feather filled pad) with pretty floral fabric and vintage trim. Each of the extra ones I made have a slight variation so that each cushion is unique. 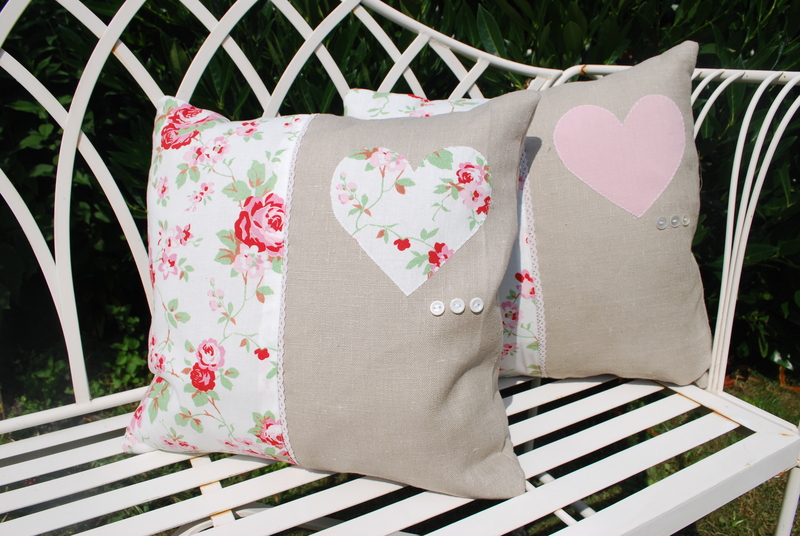 There are four available to choose from, two have hearts in matching fabric and two have plain fabric hearts. Coordinating bunting is also available.